Coalition Chairman Levin warns a coalition change is in the cards, but 'irresponsible' Lapid's party may find itself out. Knesset Coalition Chairman MK Yariv Levin (Likud) on Saturday indicated in a TV interview that the coalition may be in for a shake-up in the near future - and that "childish" Finance Minister Yair Lapid (Yesh Atid) does not have high chances of being invited back in. "We must weigh the possibility of a change in the coalition composition through the addition of the haredi parties," Levin told Channel 10. "It might be that there's no choice but to leave Lapid out." 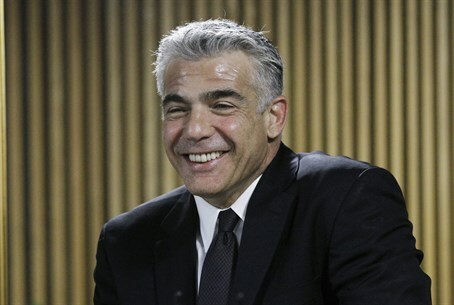 Lapid has long been at odds with the hareidi parties of Shas and United Torah Judaism (UTJ), particularly through his push for the Enlistment Law requiring a mandatory hareidi IDF draft, and recently through his 0% VAT bill that would give those who serve in the IDF benefits buying their first home. The latter bill has received such harsh criticism that one hareidi MK from UTJ recently threatened "apartheid" Israel with an "Arab rebellion" over the bill. Levin also slammed Lapid for his statements during Operation Protective Edge in Gaza; not long after Israel reached a ceasefire with the terrorist group Hamas, Lapid called for a return to the "diplomatic" process, urging a return to peace talks. "If such not serious, irresponsible and even childish behavior continues, then we certainly must consider the possibility of a change in the composition (of the coalition)," said Levin, subtly targeting Lapid. The Coalition Chairman added that because of the need to consider a change, he is not worried about Lapid's threats last Wednesday to quit the coalition if taxes are raised following Operation Protective Edge. In response to Levin's criticism, sources in Yesh Atid said "we will not submit to the shady business of the past and the political extortion of those trying to ride on the backs of citizens of the State of Israel." "Minister Lapid is firmly against raising taxes and for strengthening the weaker and middle social classes that contribute to the Israeli economy, serve in the army and pay taxes," concluded the statement. There may still be complications if Likud were to try to create a coalition by bringing in the hareidi parties, however, as the Jewish Home party was also key partner in pushing through the Enlistment Law. The tensions Levin's statements point to with Yesh Atid come at a time of general instability among coalition members. Prime Minister Binyamin Netanyahu's approval rating took a critical blow in the Gaza operation, rising to 82% early on at the time of the IDF ground entry to Gaza, then plummeting to a paltry 32% after Netanyahu sealed a ceasefire deal with Hamas. Jewish Home likewise has been showing a lack of unity, as there has been talk from senior members of a split in the party over a new party constitution critics say will give chairman and Economics Minister Naftali Bennett excess power, and which inside sources say indicate a shift of focus to the secular public.